Basilinna, in partnership with the Middle East Institute (MEI), hosted a program entitled “China in the Middle East: The Silk Road Ahead", on Friday November 4, 2016. 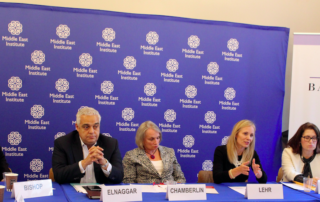 The roundtable gathered experts on China and the Middle East and Northern Africa (MENA) region to focus on the growing political and economic ties between the countries as well as the implications of these growing ties on U.S.-China/U.S.-MENA relations. Wendy Chamberlin, President of MEI, moderated the program. As China follows a strategy of encouraging their state-owned enterprises and private companies to seek investment and trade opportunities overseas, the MENA region has become one of their growing targets. Clearly, as seen through President Xi Jinping’s visit earlier this year, there are political as well as economic reasons for China increasing its relations with the Middle East, and especially with Egypt. In his visit last January, President Xi began his visit in Saudi Arabia, a main source of much-needed petroleum. He then went to Egypt, which China has elevated to a “strategic partner," and was the first major leader to visit Iran after the Joint Comprehensive Plan of Action (JCPOA) agreement was reached. Ambassador Yasser Elnaggar, the Egyptian Principal Deputy Minister of Planning, Monitoring and Administrative Reform, kicked off the discussions by expanding on the newly elevated "strategic partnership" between China and Egypt, which identified Egypt as a prominent leader and China's main gateway to the MENA region. As part of this new partnership, during President El Sisi’s visit to China, 28 Memorandums of Understandings were signed between Chinese and Egyptian companies for work in Egypt, and more followed when President Xi traveled to Egypt earlier this year. Chinese state-owned enterprises are investing primarily in infrastructure including energy, railways, maritime and construction. Most recently, China has committed over $35 billion in contracts to help build Egypt’s “New Capital”. Companies like China Fortune Land Development and the state-owned China State Construction Company are the main investors. Elnaggar went on to stress that while state-owned enterprises are investing, there is still a large need and market for direct investments from private Chinese companies in Egypt and the MENA region. Deborah Lehr, Chief Executive Officer of Basilinna, made the point that as the economic relations expand and deepen between China and the MENA region, its foreign policy will follow suit. As part of President Xi’s One Belt, One Road Initiative, China is looking to expand its presence and role throughout the region. It is using economics as a means to build political good will and influence. This will continue to grow, especially as the United States reconsiders its policy priorities in the Middle East. China is seeking to use its economic might as a means to exert its influence and views, especially as it pours massive amounts of much need infrastructure financing into the region. Bill Bishop, author of the Sinocism China Newsletter and recently returned from a decade in China, provided insight into China’s domestic politics. With the 19th Communist Party Plenum approaching in fall 2017, President Xi is focused on organizing and strengthening the Communist Party as well as placing his own loyalists in key positions. Once his team is in place, China will need to continue its push to expand economically -- and potentially militarily -- overseas. One concern is that China may try to expand foreign policy reach through arms sales in the region and potential placement of military bases. China established its first overseas military base in Djibouti and is rumored to be exploring additional sites in the MENA region. It is unlikely, Ambassador Elnaggar stated, that Egypt would agree to host one. Randa Slim, an adjunct research fellow at the New America Foundation and Director of the Track II China-Middle East Dialogue Initiative at the Middle East Institute discussed the reaction of Middle East countries to China's growing role in the region. In some instances, China was a welcome partner and has played a role in supporting the final Iran Nuclear Deal. On the other hand, China has traditionally voted against punitive measures against Syria in the United Nations, which, Dr. Slim expressed, was viewed with suspicion by certain countries that China was taking sides with Russia and other established governments in the region. In conclusion, with China-MENA relations strengthening, politically and economically, the United States will need to re-evaluate its foreign policy objectives in the region. For over 30 years, the U.S. was the region's main ally with limited competition. Today, the shifts in governments and leadership provide opportunities for new alliances to form, with the economy playing a major role in steering changing political ties. The U.S. does not have the same financial capability nor inclination to provide the types of concessionary financing in the MENA region that China does. As a new President takes office, it is a good time to undertake this serious review and examine on-going sources of U.S. leverage in the region.